I just have to share something I find really, really cool. First of all, I want to recognize a great guy who partially inspired me to start this blog and who is on a journey similar to my own, but equally different. The Dharma Loser (as he sometimes refers to himself)…check out his blog at http://www.dharmaloss.com and enjoy. He's got a really cool blog going over there, and it's worthy reading if you're looking for some inspiration in your own weight loss or life changing journey. Anyhow, I mention him because I added links to some sites that I like a lot yesterday, and many of them are sites that I wouldn't have found if not for his blogroll. 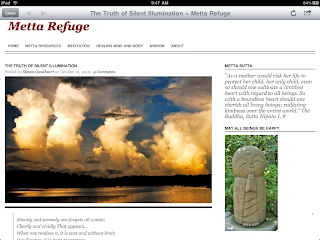 One of the sites he links to (and now so do I if you check out the link list to the right!) 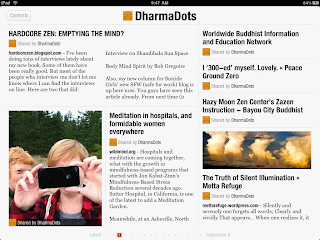 is DharmaDots. I'm not a Buddhist, and I'm not a vegetarian or vegan, but my ways have more in line with these than anything else, so who knows. Anyhow, While surfing all the cool sites, looking for interesting stories, I was lamenting that I simply don't have time to go looking for all this information. 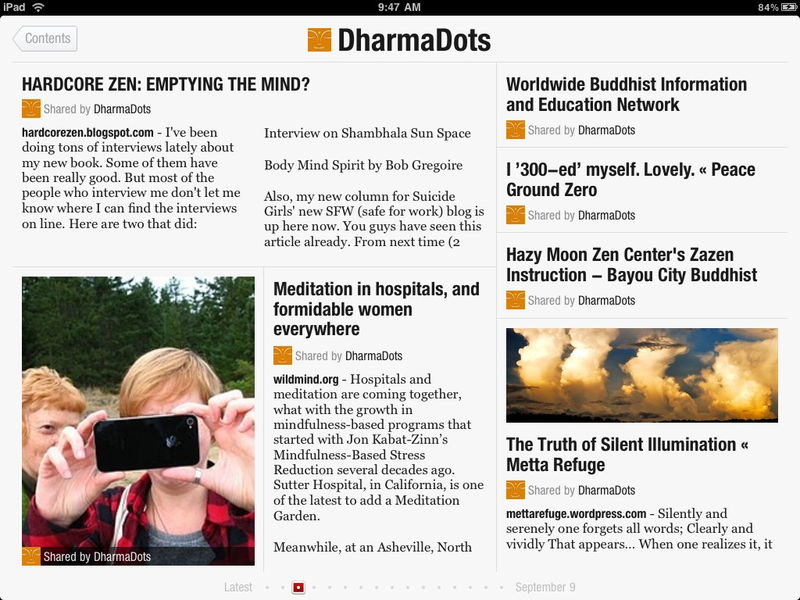 Then…I found DharmaDots. 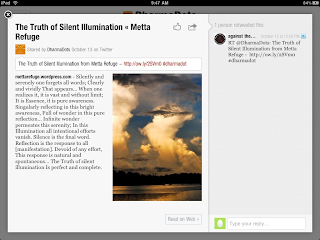 The mission of DharmaDots is to be a clearinghouse of sorts…a one stop shop for all the OTHER cool sites related to Buddhism. In itself, I found it to be pretty great. 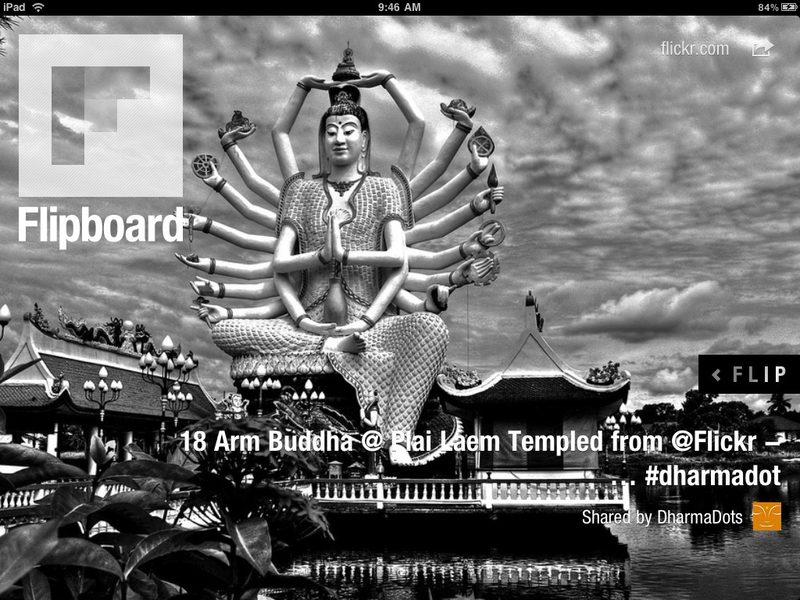 The thing that makes it spectacular is when you combine it with another awesome app called FlipBoard for the iPad! 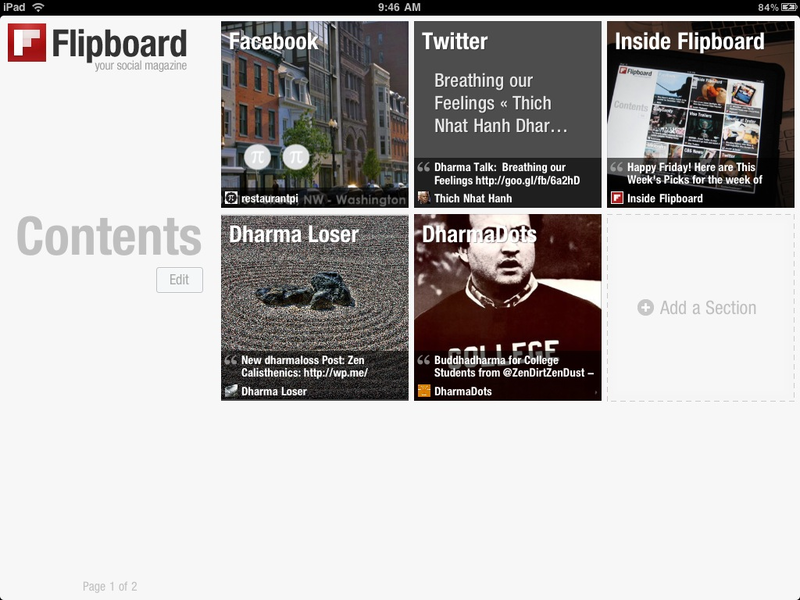 If you have an iPad, FlipBoard takes all your Facebook, Twitter and other misc. FlipBoard provided news and entertainment content and turns it in to an A-W-E-S-O-M-E interactive magazine (which is 1000% cooler than it sounds). To truly appreciate it, you'd have to see it in action. I don't have a video of it in action, handy, so here's a few screen grabs. The cover looks like any magazine, and rotates pictures from recent posts. 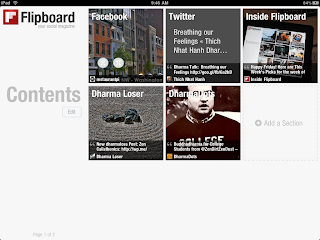 The "Contents" allow you to tap on whatever media source you want to read. From your list of "articles" you can tap on one if you want to read more. It brings that full screen, and then from here, if you still want more, you can tap on the link to view it on the web. From here, you can just tap to close when done and it backs up a level, and again and again. It's VERY fluid and easy to use. It truly makes the most of the iPads' touch screen. This has, in effect, given me everything I could possibly want in terms of Buddhism related (or any other) content in a magazine! 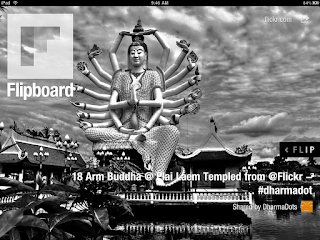 If you have an iPad, I HIGHLY recommend FlipBoard and DharmaDots!